Below post tells how Host based reversals and Terminal based reversals happen in Credit/Debit cards processing. Connection timeout usually occurs within 5 seconds. Connection timeout indicates that connection with the back end server is impossible, and the server, to which the data needs to be transferred, cannot be reached. Issues with connection can be caused by DNS problems, server failure, Firewall rules blocking specific port, or some other reasons. In such cases the, a backup (or secondary) URL can be used (if available). If no connection can be established through either URL of a given service, further processing of transactions is impossible. It is important to note that no information is communicated to the host server when connection timeout occurs. In this scenario customer will not be charged, since transaction message is not communicated to server. There are two approaches that are used by integrators to deal with situations like the one described above. 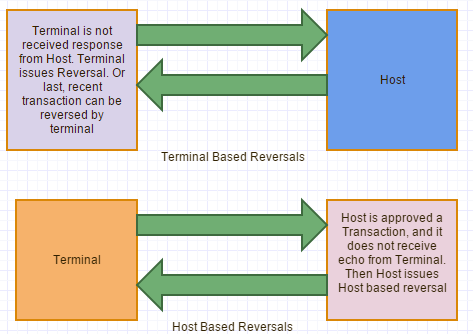 These approaches are, generally, referred to as ‘authorization and capture (Terminal based Reversal)’ (explicit or implicit capture) and ‘timeout reversal (Host based Reversal)’. The basic premise of authorization-and-capture (aka Terminal based reversal) approach is that any authorization processed has to be subsequently captured (confirmed) by an additional request. In case of Host based reversals– If timeout occurs, the submitting system does not send out the confirmation (since it never got the response), and, consequently, the host system reverses the authorization (because it has not been confirmed). The capture operation can be executed in one of two ways: explicitly or implicitly. In case of explicit capture a separate ‘capture’ request is sent to the host server to confirm a previously successful authorization. In case of implicit capture, the reference number of the previously successful authorization that needs to be captured, is included as part of the subsequent authorization, or as part of the final settlement call. Hope you got best knowledge on how host based ad Terminal based reversals will work. You can write us if you need more information.